I am studying for a BA (HONS) Photography degree at the University of Portsmouth. At the beginning of 2009 we started working on a unit entitled 'The Body'. At the end of December on a return flight from Spain I sat across the aisle from a mother who was breastfeeding her daughter of around two years old. 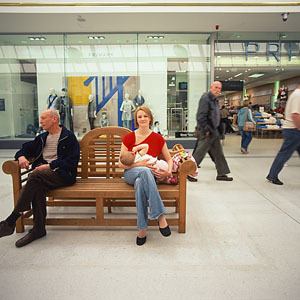 Whilst I and many of my friends had been breastfeeding mothers, seeing a mother feeding an older child in public was a rare sight. I had found my topic for 'The Body' unit. On returning home I began to research various aspects of breastfeeding. To my surprise both our government and the WHO recommend breast-feeding children up to the age of two as a minimum. Given this advice why do we not see more mothers breastfeeding longer? Only 2% of mothers breastfeed their children beyond six months. 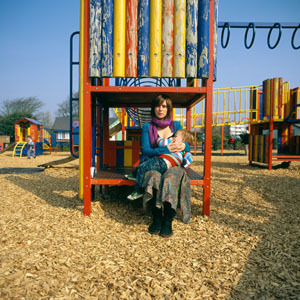 My aim was to produce a series of environmental portraits of mothers feeding their children of over one year old. I did not want to over sentimentalise the images, but wanted to question western society's taboos concerning breast-feeding older children in public spaces. 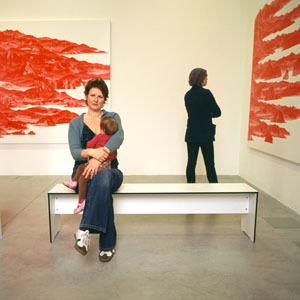 My desire was to create images that reflected a diversity of mothers, children and locations. Prior to starting the project I had reservations myself around children feeding from their mother's breast over the age of six months. Whilst I breast-fed my own son who is now seven, I was under the impression all the benefits of a mother's milk more or less cease around the six month mark. I had assumed that feeding was continued more for the mother's benefit of holding on to their babies. I had other questions about body ownership and whether the child continued to feed more as a way of claiming the mother's body. So when I started the project I was pro-breast-feeding but couldn't say I was an advocator of continued feeding. However I did think that it was and is important for the mother and child to make that decision and that whatever the choice it was something that should not be frowned upon. I am very fortunate to be living near the city of Portsmouth, a city that has a strong network of support for breastfeeding mothers. I contacted a local Lactation Consultant, Lynn Timms, who put me in contact with six mothers, Fleur, Janet, Jo, Lucy, Donna, Alice and their children. I was keen to take a collaborative approach, therefore before taking any pictures I met with each of the mothers and their children. We discussed how they felt about feeding their children in public, where they fed and what locations they thought were appropriate to photograph them in. It was clear to me from my initial meeting with my first recruit, Fleur that both mother and child were benefiting from continued breastfeeding. The more time I spent with the mothers who were all intelligent, supportive and open minded the more natural it felt that they were continuing to fed their children in the most natural and appropriate way possible. All of the mothers helped with the creative process and have been more than just the subjects of the final images. When I started my degree I knew I would come out the other end with new technical and creative skills. However working with these mothers and the venues where I took the images has brought more benefits than I had expected. For a short period I have worked with a group of positive people with a common goal. Of course there were some venues that were not so supportive and either ignored or refused my requests. However the ones that agreed for me to use their facilities have more than made up for the negative responses. I would also like to thank the following venues: - The Cascades Shopping centre, Café Nero, Costa Coffee, Portsmouth City Library, Burger King, Havant Leisure Centre, The Wine Vaults, Debenhams, The Aspex Gallery. Not all of which feature in the final selection but all of which were supportive. Finally a very special thanks to Lynn Timms without whose support and enthusiasm I would have struggled to complete this project.